The Office is coming to FirstEnergy Stadium on Sunday, June 30th with a special guest appearance from beloved character "Kevin Malone." 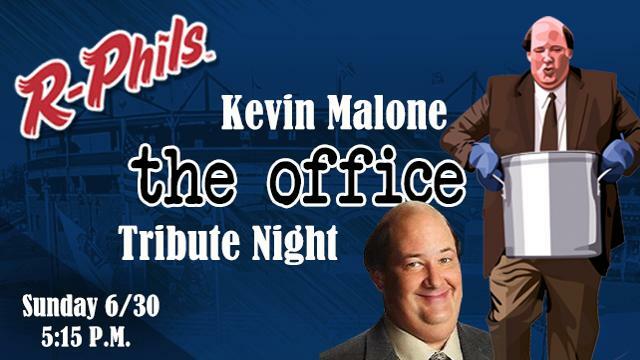 Brian Baumgartner, who played Kevin on the series running from 2005-2013, will be on hand as the Reading Fightin Phils celebrate one of the nation's favorite television shows. Gates will open at 3:30 p.m. before first pitch between the Fightins and Portland Sea Dogs at 5:15 p.m.
Free autograph and photo sessions with "Kevin Malone" will be available during the game. Fans have the option of purchasing a limited edition "Kevin with his famous Chili" bobblehead plus a ticket to the June 30th Fightin Phils game for $35. The $75 VIP Meet and Greet package is sold out and no longer available. Packages are available now at https://www.ticketreturn.com/prod2/Buy.asp?EventID=273024, or call or text 610-370-BALL.